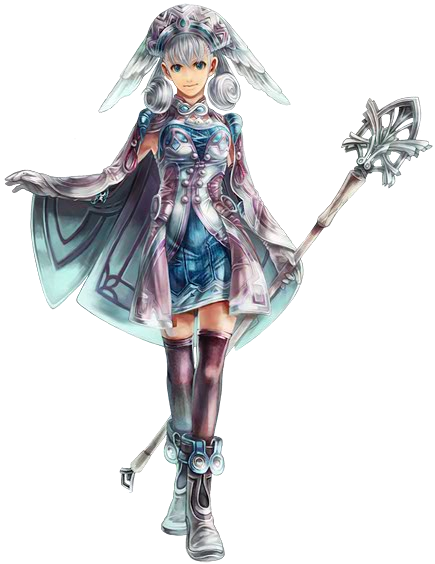 Melia is of the High Entia race that mostly reside in the city if Alcamoth. Relatively, Melia is quite young when compared to other members of her race. The party first encounters Melia in Makna Forest. Melia uses ether(magic) to attack, making her the only mage in the game. Melia is capable of doing serious damage if the right gems and skills are equipped on her such as Electric Plus. Unfortunately, the AI does a poor job of handling her. However, if you personally control her, she can become a force capable of single-handedly defeating the toughest of enemies.